Directions (Q. 6 – 10) Study the following information carefully and answer the given questions. 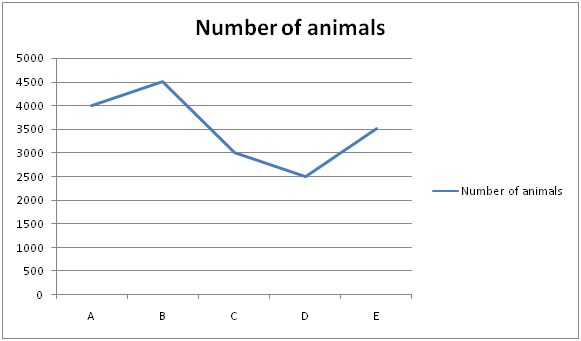 The following line graph shows the number of animals in 5 different forests. The table shows the percentage of herbivores and omnivores. 6. Find the ratio between the total number of herbivores in forest B to that of total number of carnivores in forest E? 7. Find the total number of animals eating plants in forest C? 8. Find the difference between the total number of Omnivores in forest A and C together to that of total number of animals in forest D? 9. Find the average number of animals in all the given forests together? 10. Total number of Carnivores in forest A is what percentage of total number of Herbivores in forest D? Directions (6 – 10) Study the following information carefully and answer the given questions. The following line graph shows the number of animals in 5 different forests. The table shows the percentage of herbivores and omnivores. 6) Find the ratio between the total number of herbivores in forest B to that of total number of carnivores in forest E? 7) Find the total number of animals eating plants in forest C? 8) Find the difference between the total number of Omnivores in forest A and C together to that of total number of animals in forest D? 9) Find the average number of animals in all the given forests together? 10) Total number of Carnivores in forest A is what percentage of total number of Herbivores in forest D?